A blog by Bellingham acupuncturist Scott Paglia, L.Ac. Several risk factors can result in high blood pressure. These factors are classified as uncontrollable or unmanageable risk factors and controllable or manageable risk factors. Age – When you age especially when you reach 50 years old and above, your arteries start to lose their flexibility narrowing the blood passageways making it more difficult for blood to pass through causing then the heart to pump harder. Men start to become hypertensive during early middle-age while older women begin to become hypertensive after menopause. 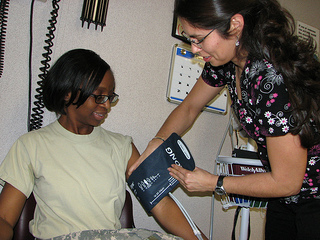 Race – In terms of race, African Americans are the highest risk group for high blood pressure in terms of ethnicity in the United States. They are also the most prone to develop high blood complications like heart attack or stroke. Interestingly, while African Americans have this high propensity for developing high blood pressure and its corresponding complications, native Africans living in Africa do not suffer these kinds of problems. Heredity – Heredity plays a very huge role in causing high blood pressure in individuals. If you have one or both parents, uncles, nieces or grandparents who have high blood pressure, you are at a high risk in acquiring it as well. Kidney disease – The kidney is where glands that regulate blood pressure reside and so when you develop kidney problems these affects those glands making you end up with high blood pressure in the end. Stress – Stress can be responsible for dozens of health conditions and high blood pressure is one of them. Finding ways to calm and relax yourself is important in living with a healthy heart. Smoking – Smoking raises a person’s BP level and it can cause complications like atherosclerosis as well. Low amounts of minerals and vitamins in the body – Having low contents of vitamin D, calcium and potassium will raise your blood pressure. Adequate amounts of vitamins and minerals while normalizing blood pressure also help lower bad cholesterol in the body. Excess weight or obesity – To be classified as obese, you must have a body mass index (BMI) of over 30. When your BMI is over 30, your blood pressure is likely to be quite high. When you are heavy in weight, your body needs to have more nutrients and oxygen and this tends to put extra pressure on the arterial walls causing your BP to increase. Sedentary lifestyle – When you live an inactive life, you tend to have excess weight or become obese and start to develop high BP. Excessive intake of salt – Salt is likely to make your body retain fluids that can heighten your BP. Lowering your intake of salt will lessen fluid retention in your body and lower your blood pressure in the process. High cholesterol – Having high cholesterol can lead to arterial blockage or make the arteries less flexible and narrower. This is a condition that can lead to a potentially fatal heart attack. Diabetes – When you develop diabetes, this condition is chronic and will never go away. It can be controlled though by eating the proper foods. Diabetes almost often leads to high blood pressure. Alcohol drinking – Drinking at least one to two drinks will cause his blood pressure to temporarily increase. Regular consumption of alcohol even if taken moderately will lead to high blood pressure that will be long-term and will require treatment. © 2019 Bellingham Acupuncture Blog · Proudly powered by WordPress & Green Park 2 by Cordobo.